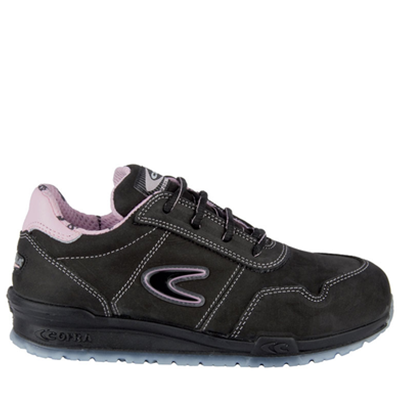 The Cofra Alice is a durable work shoe, lightweight, stylish and provide the highest standard of comfort. Foot injuries at workplaces are very common and it may come in any shape and size. This is why wearing of safety shoes or boots with toe caps is essential as it will protect your feet from mishaps. Cofra Yard S3 has an Aluminium 200 J top cap that will protect your feet from heavy falling objects when working. The sole of this shoe has TPU (Thermoplastic Polyurethane) this provides your shoe with improved slip resistance. The outsole this shoe is made up of rubber, rubber is slip resistant when exposed to water and oil than other outsole compounds. This softer rubber outsole means that a slip resistant shoe can more effectively grip a slick floor. This shoe has an APT Plate that is non-metallic, flexible, light, resistant to any type of perforation with low electrical resistance. The shape of the Cofra Alice guarantees comfort when walking. This shoe absorbs impact shock avoiding stress to the spinal column. This shoe is antibacterial and breathable. Absorbent and adsorbent, which keeps the foot always fresh.